Let the kids burn off some energy on the football field at Interlude campsite. Take part in some sports on offer. Burn off a few calories in the gym. Get the best of both worlds at Interlude campsite - enjoy the park and the nearby beach. Like fishing? You won't be disappointed here. Horse riding is available during your holiday. There's water sports on offer - what a treat for your holiday. Want to see the local area, hire a bike during your holiday. Worried about the temperature of the outside pool? Don't be, a covered pool is available at Interlude campsite. Take some time to yourself, and spend a little time at the Spa. Get out and explore the area. Want to have a closer look at Interlude campsite? If you think Interlude campsite in Ile de Ré, Gascony, Gironde & Île de Re is the holiday park you, why not have a closer look, and check out prices and availability. Interlude campsite family holiday park has 387 pitches. Eurocamp have family holidays parks all around Europe. Interlude campsite (AT011) is just one of the family holiday parks in Ile de Ré, Gascony, Gironde & Île de Re, France. Have a look for other holiday parks in France. You can also see what other people though with the reviews of Interlude campsite. You and your family will have a fantastic time, whichever park you decide to holiday at. With children's entertainment, water parks, and plenty to see and do in and around the holiday park - you won't stand a chance of getting bored! These are the reviews for Interlude campsite. There are 83 reviews. Second visit to this parc. The beachside location is just perfect! This was our 5th visit to interlude so we knew what to expect. Brilliant location right next to a lovely beach. Island perfect for cycling as it is flat with lots of bike paths and quiet roads once you get off the main drag - st martin and la flotte are only a few miles away. Indoor pool is peculiar and we didn't use it. Entertainment is a bit hit and miss but they do try their best and have separate entertainment early evening for children, at least they did in august. Shop is well stocked and restaurant is quite good as are takeaway pizzas. We have had mixed weather on re over the years and this year was no exception - very strong winds and rain for a couple of days - at least one tree down on site. The end of the week was glorious. Beautiful island, great access to fabulous beach direct from site. Shame eurocamp don t have any chalets, our tent needed an upgrade and was not a great pitch. Courier did the minimum possible. Very disappointed that after driving through the night to ille de re that we were not allowed to enter or park at the campsite until 3pm as the courier wasn't able to allocate us a pitch or sort us with bands?!? we would not have chosen the travel arrangements we did if we knew this was going to be the case and on all you documenting it states that we could use the site and facilities on arrival. A very stressful start to the holiday with 2 kids and no sleep!!! Fabulous holiday. Good facilities on this parc, shop and restaurant good. Swimming pools pretty rubbish and freezing cold! ile de re is a brilliant destination. Will definitely go back! This is our second time at this site and overall our holiday was much better than our first experience. This was mainly due to us knowing more about the island and also the public transport. We did this holiday without a car - we flew, used buses and hired bikes for the 2 weeks. This was a brilliant way to see everything the island has to offer. The site is clean, well looked after - there was always staff cleaning the toilets and maintaining the grounds. The pool is still very cold - our children struggled to stay in the pool for more than a few minutes. We used the restaurant on the last day. It isn't the cheapest place to eat but the food was lovely, the staff were very friendly and helpful and there was great choice. Our pitch was great - it was very private and away from the toilet block although there are eurocamp pitches that are less private. . the campsite location cannot be beaten - the beach is fantastic for children, the buses, in particular the free electric buses enable access to nearby villages, the market in bois plage is super for fresh produce. We highly recommend it. Very expensive accommodation. No chairs or little table in tent. Terrible weather. Poor pool facilities. No area to exercise puppy despite paying extra - not sure for what. Ants in the tent - not treated. A beautiful island, site had everything we needed and facilities ok (toilet block in need of renovation but fine). pitches small compared to inland sites and dotted over the site. Shaun (rep) very helpful and tent was the cleanest we experienced over three sites. Definatley take your bikes! Lovely parc and ile de re is great for beaches and cycling however our pitch was very small and tent fraying badly at the seams. The courier was nice but completely unhelpful luckily park reception were much more helpful and bikes activities and provided advice. This was our third year in ile de re and again we have had a fantastic holiday.great access to wonderful beach,fantastic size pitch,helpful courier who called by the tent each day. Seafood and cycling on the island are both amazing and we cannot wait to return. We really enjoyed our experience on isle de re. The campsite was really good - good pools, excellent beach and there was plenty to keep everyone happy. The local area was beautiful and we really enjoyed hiring bikes to explore the island. We initially thought the location of our tent was a bit remote, however we began to appreciate the peace off the main thoroughfares and also the trees provided some welcome shelter from the sun on hot days. The campsite was a bit noisy up until 11pm, due to an inconsiderate group nearby who were very loud, but this died down after the curfew time. Enjoyed the park which by french standards was reasonably spaced out. Very disappointed in our tent however. Nice parc maybe a little cramped in the height of the season. Great for beach, good position on the island. We have sent in a complaint regarding the campsite owners (interlude). using the site facilities for their private functions on 2 occiasions during our stay there. We were unable to use the resturant or bar areas for a period of 3 nights and days..simply not good enough!! eurocamp should have been advised, and then advised its customers, why didnt this happen? in addition to the above,we had people to endure the private function disco until 4 am in the morning, and noisy people staggering around. The site rep has forwarded our complaint to youselves. The value for money rating was improved by having a tamba discount and going out of high season. I believe the camp is much busier in high season and may not get such a high rating. We also suffered from cold showers most days which is not ideal with small kids. I found all eurocamp employees especially at the call centre fantastic! Had a great weekend, everything we needed in the tent, and onsite. loved it! This was my first experience of camping at the age of 39 with my husband and three young children. excellent value for money, great site with lots of facilities and a very well equipped tent! the bed was more comfortable than any hotel bed i've slept in. Toilet and shower block were always very clean. Beautiful parc, although the pool area wasn't as big as expected and far too cold. Great for a family holiday, bikes are a must. Direct access to the great beach was fantastic, swimming pool great although older kids would've liked a slide (not just the little one in baby pool). park itself was nice and pitches were mixed and landscaped very well however the toilet/shower facilities were busy, often had to wait for shower or toilet, and could do with a refurb but overall clean. island has great cycle paths that accommodate all ages/levels. Wonderful, especially having beach access. Fantastic ! the site is within 200 m of a lovely sandy beach. The site itself is excellent, clean and friendly. I would recommend that if planning a stay, a bicycle is essential, driving around the island is far too stressfull ! take a leaf out of the locals' book, cycle and enjoy the miles of cycle tracks available. We enjoyed exploring the ile de re, however we were disappointed with the shower and toilet facilities on site. Good park, facilities good and very clean. Derek the courier was fantastic, the best prepared tent we have ever had in terms of cleanliness etc. Also good location on the beach and the island is stunning. Only small complaint is that the bar is pretty expensive but will be back next year! Toilet blocks were not always clean, the clubhouse was very expensive and the swimming pool was the coldest I have ever known. On a positive the eurocamp rep was professional, on site entertainment was good and tho expensive the food in the restaurant was very good. A wonderful relaxing holiday - with lots of cycling around the island, table tennis and beach! The parc's facilities were fine. Everywhere was kept clean and maintained and the proximity to the beach was great. It was also well situated for exploring the ile-de-ré by bike which we really enjoyed doing. The only complaint I would have is our pitch was too hemmed-in by other pitches. We weren't able to park the car next to our tent and we felt like we were a bit cramped, and right by the entrance to the parc. We didn't appreciate being next to inconsiderate couriers (of one of eurocamp's competitors) who made noise which disturbed us until well past midnight in spite of a parc no noise rule between 11pm and 7am. Obviously if we'd had a decent pitch it would have made a big difference to our experience. Just got the feeling that too many pitches were being squeezed into a limited space. Pretty happy on the whole though. Derek was so helpful and the texts the day before from him were so helpful. the tent was so clean and in a location we requested so were impressed with eurocamp for getting that right. the tents were too close together for us and the showers and toilets were not clean and in dire need of refurbishment. the park was great though and the location to the beach was fantastic. we did the whole holiday without a car so do hire bikes from the camp site. the main pool and resaurant area was really nice and modern but the main outdoor pool was absolutely freezing and our kids only went in the indoor pool which was a pity. overall the island is beautiful but showers and toilets let the site down totally. Our holiday started off really badly in normandy where we arrived to swimming pool of water on the tent site. Luckily no water had entered the tent, but nothing had been done to try to move the water. We couldn't access our tent and my husband spent nearly 3 hours up to his knees in water trying to clear the site. if this had been our first experience of eurocamp we would certainly not be returning!!! We had an excellent holiday at interlude on the ile de re, the accommodation was as expected and cleaned to a high standard. the parc facilities (pool, bar, washrooms, toilets etc) were all cleaned to a high standard. would recommend the parc to others - such a great location. Although we had a lovely holiday, and the ile de re is always great, we were a little disappointed by some aspects of the campsite as it was not as peaceful as the eurocamp brochure had suggested and was very overcrowded in the pools and all other facilities. We enjoyed 8 days here, its a fabulous location and the courier derek was very friendly and helpful. Our disappointment lies with the sight not being as quiet and low key as stated in the brochure. Often at night there was alot of noise however this was cut at 11pm. Suneilia interlude is a relaxed, well run parc in a lovely location. Lovely island, good local buses, busy. Great location close to the beach, fantastic markets. The best meals we had we cooked ourselves after buying from the local markets-a seafood heaven. Lovely clean facilities. Great beach location. Clean and safe site, especially for children. Lovely island, ideal for cycling. Would definitely return. Ile de re is a little gem in france it is my third time going and second as a family. you cant fail to havee a good time. we flew last year and this year decided to do the ferry and drive option although a massive journey from. Cumbria it was all seamless and the kids loved the overnight ferry from st malo. Would I recommend this holiday absolutely! A wonderful location, fabulous tent and facilities. Helpful rep person, and delightful beach/pool etc. Only disappointment was the bike hire place. We hired 6 bikes and got charged three times for vaious repairs that were clearly not our fault [we suspect had been not well serviced..but having paid for a week for six bikes we were in a no win situation] ended up hiring bikes from local town, cheaper and much better quaity and service. Fantastic park - fourth time we have been. Shower facilities poor, toilets ran out of soap consistently - health hazard. Closed at 11?. I worked for keycamps 25 years ago and showers are as bad as they were then. . also kids club french not run by eurocamp as I thought. You say this park good for kids and teenagers but I didn't find that to be the case. Park setting was nice with plenty to do - we enjoyed the cycling despite mixed weather. ile de re is a great location. shame eurocamp only do tents there, would prefer a static. We have just returned from 12 nights on interlude and have already booked again for 2015! we visited the parc about 15 years ago and I have always wanted to return. I wasn't disappointed and it was everything and more that I remembered. . the site was perfect for our needs - family of three adults with the right mix of peace and activity / site buzz/ atmosphere.they have retained the feel that you get on a true camping site. Some sites have lost that with too many mobile homes. We were very pleasantly surprised to have a couple of evenings with live music,of good standard. We chose the site for its peace and quiet and the music did not spoil this as the 11 pm quiet rule was strictly observed. I hade been a little worried about the facilities having read a negative review. They were absolutely fine and with plenty of showers. Our very tiny problem was on the day of departure ,not being able to shower,due to them not opening until same time as barrier,ie 8.15. Gorgeous location,cycling very good,local supermarket on edge of st martin catered more than adequately for cooking in every night, great choice of sea food and fresh fruit and veg. Interlude is a fantastic site, beautifully looked after with great facilities. Excellent lifeguards at beach and pool side. Il de re is perfect taste of france. No matter the weather their is loads to do and cycling is manageable by all around the whole island. Special summer buses even take your bike if you cannot manage the distance. Local towns with daily markets spoils all with such excellent food and gits. This was our second time at interlude and very happy to return again. Fantastic holiday on a beautiful island. Weren't as happy with our pitch this year as last but would definately go back to interlude again. We've been to the parc before and loved it yet again. We did enjoy our holiday but the tent was far to close to the next tent. we may as well have been sharing a tent! this did spoil our holiday as we were kept awake quite a few nights. Good site, enjoyed the close proximity of the fantastic beach. Indoor pool great for young kids. Fab weekend away and we're looking to book with you again for september! Apparently if you're only on a two night break you get put in the old staff tent next to the entrance/exit barrier, by the bins because it's easier for the courier to do the changeover. memorable. We had a fantastic holiday on the ile de re, it is a beautiful island with lots to do with a family. the cycle tracks are great and cover the whole island so a car is never needed! Had a fantasic time at ile de re will return when family is a little older to hire bikes and explore what we missed. Super holiday. Lovely campsite, very 'natural', grassy pitches, situated on pictoresque island. Right on top off a lovely beach, great cycling + hire on campsite, pretty villages, oysters, salt and potatoe farming - real french beauty. Absolutely loved it. First time but will be returning next year. Holiday rep dave was very helpful and friendly - great rep! toilets and showers on site could b cleaner some mould in shower cupicles, but a very nice place apart from that. Ile de re is a great place to holiday if you take bikes. I didn't drive the car for 11 days; we cycled everywhere. The velo mouettes (buses with trailers for bikes) made even getting to other end of the island easy. We had fantastic weather (one morning of rain). le bois plage and st martin have market everyday. The quality of food was excellent but quite expensive (especially meat). A good park with decent facilities, although a little tired in places. The park has a good range of activities and entertainment, and is in a prime location for an outstanding beach - and within easy access of some lovely cycle paths and stunning villages. The tent/pitch had a few minor problems and the shared toilet/wash facilities were not very well maintained. The courier was pretty pointless from the outset, which meant we lacked basic area/camp info. Early on and this detracted from our getting the most from the holiday. A great holiday choice, but we did expect a little bit more from eurocamp and this higher-end site. The ile de re was beautiful. the camp location was great, the cycling experience was very enjoyable. Absolutely fantastic island. Cycling paths vey well suited for all ages to use. The parc layout and facilities enabled my children to enjoy alot of freedom that they don't normally get. The proximity of the beach to the campsite was superb. Because of the island layout and park position we parked our car on arrival and didn't need to use it again until our departure-perfect. Interlude is a well run campsite, and the eurocamp operation was its usual helpfulness in booking the holiday. cost-cutting around the edges a little more apparent this year: longer on hold to contact eurocamp, no canvas bag this year :( but overall we recommend eurocamp to our friends. . courier dave @ interlude maybe needs to smile more, but he wasn't a major factor in the holiday. Overall a really enjoyable holiday, from the ease of arrival (tent already set up! 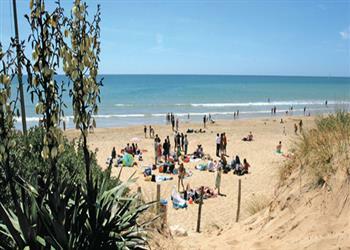 ), through to a really child friendly parc with an excellent swimming pool and only a very short stroll to the beach. Ile de re is a beautiful lsle full of charming villages. it's ideal for just cycling around at a leaisurely pace (flat with cycle paths between all the villages). a lovely place to unwind. A eurocamp stay at interlude offers a great break for a family even with kids' ages from 6 to 16! Great holiday but parc toilets were no way clean enough. We will not camp at this site again which unfortunately means we will not use eurocamp. Excellent holiday campsite was lovely, beach was great. our eurocamp courier (dave) was very welcoming and friendly. Excellent holiday on the beautiful ile de re. the campsite is one we know well and has nice facilities in a great location. eurocamp tents are excellent and have great storage, comfortable beds and are generally of a much higher standard than those of other operators on the site (we stayed in a canvas tent last year). nice weather helps too! We were only staying for 3 nights as we were joining extended family already there. booking was incredibly easy and the updates and holiday count-down (online) was useful. It's a nice touch receiving the personalised local guide and map. ile de re is lovely. Perfect for families with the beautiful long beaches, wonderful and easy cycling and pretty villages and markets for pottering. It's also incredibly easy to get to if you're not driving (easy jet to la rochelle and then bus/taxi to the site). we'd definitely return to the area. Nice site but was ruined for us as our pitch was on sand. This was a nightmare with a one year old who couldn't then crawl outside as she got filthy and was eating the sand. We ended up leaving early as we got fed up of sweeping the tent out. Enjoyed cycling on hired bikes. Very pretty island with quaint picturesque towns and villages. Locals both friendly and helpful. Great holiday, cycled everywhere. Beach was lovely and surrounding towns adorable. Everything was excellent. Distance to toilets too far from tent for middle of the night use! The location of the parc was absolutely fantastic and the island itself is very relaxing and peaceful. The parc itself is a little scrubby. The facilities look like they need more than a bit of cash spending on them. Also the gates open way too late in the morning if you have an early trip back to calais. We had a bit of an ant problem in the tent too. . . the courier left us to it which we love, and the booking experience was great, barbara was the lady's name. She's brilliant. A lovely site in a great location for cycling, the beach and seeing the island. as we were here slightly out of season, it was quiet and we were able to use any facilities at any time with no problems. the isle de re was gorgeous, will definitely return here in the future. travelling on a sunday also meant blissfully empty roads and an easy journey. Great time had by all, next time we would request to be a bit nearer to toilet/shower facilities. This was our first time with eurocamp so had no idea what to expect. We had a fantastic time at interlude on ile de re with eurocamp. We are a family with one teenager and a toddler so accommodating both is difficult, however this holiday was perfect. The courier meet us upon arrival was friendly helpful and playful with the children. Eurocamp provided toys suitable for both children. The tent was spotless and well kitted out with everything we needed. The campsite facilities were clean and tidy. . highly recommend eurocamp and this campsite. I am already looking to book with eurocamp again. We had a fabulous three days with eurocamp , tents were spacious for a family of 4 ( 6 may find it a bit cramped) philip our rep was so kind, friendly and helpful. I felt the children were very safe in the parc. Very family orientated, close to amenities and the beach. We had a blast!!! Les Charmettes - Ave Le Palmyre,17570 Les Mathes. Le Lac Des Reves - 34970 Lattes.